At Hall’s Pond Nature Sanctuary, in the bustling core of the Town of Brookline’s main shopping district, close to stops on the MBTA Green Line (B and C) adjacent to a recently renovated park and athletic field featuring well-used tennis and softball fields, loved by dog walkers and hosting Frisbee games, there is indeed a sanctuary, that “oasis in the city” envisioned by Olmsted. Here is a place for respite from the frenzy of everyday activities. A place to enjoy a visiting heron. 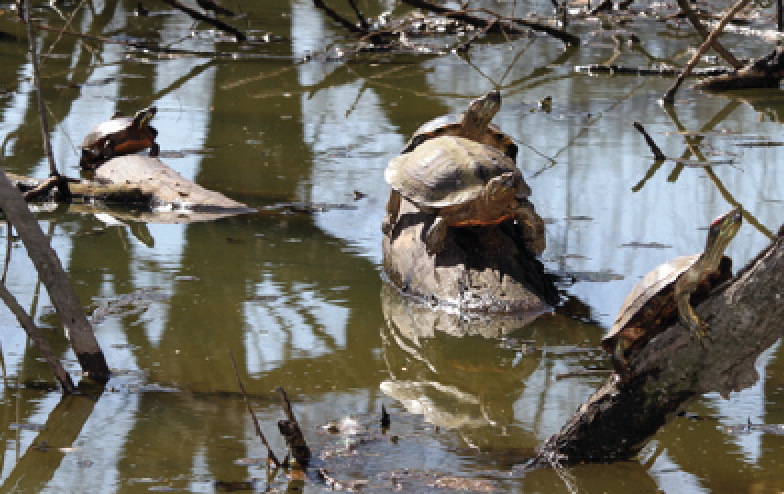 A place to watch for turtles basking in the sunshine. A place to walk gently on a misty afternoon, on the boardwalk around the pond. A place to sit quietly in the formal garden. A place to take photographs of the trees and the gazebo in Amory Woods. A place to think. A place to dream. 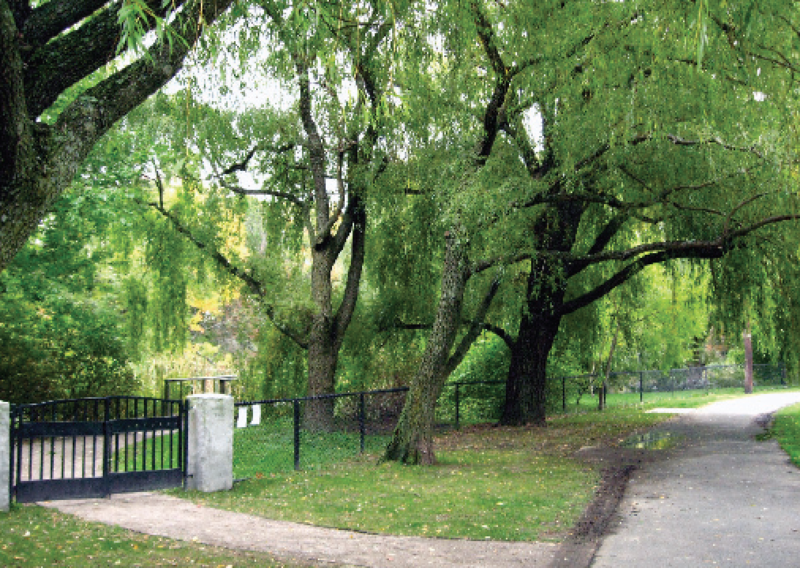 The Board of Directors of the Friends of Hall’s Pond, in partnership with the Town Of Brookline Conservation Commission, has, for thirty-five years, worked to preserve and protect this unique resource in our community. We urge you, our readers, to join us in our endeavors. We encourage you to visit. We hope that you will become involved. There is a lot to explore. There can be a lot to learn. 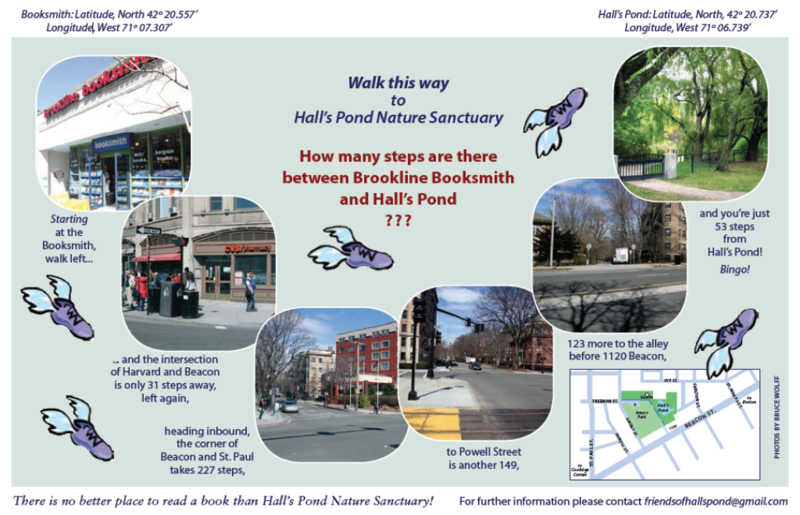 Hall’s Pond serves as a four season outdoor educational opportunity and hosts the Brookline Green Space Alliance Learning Project for Brookline students. 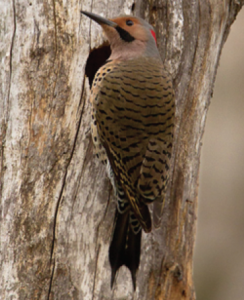 Come early for bird watching, come often for Community Work Days, come for the Formal Garden and the wood wetland, come for the Upland and Amory Woods, come for gentle walks and quiet times. Come refresh your spirit. Come join us at Hall’s Pond. 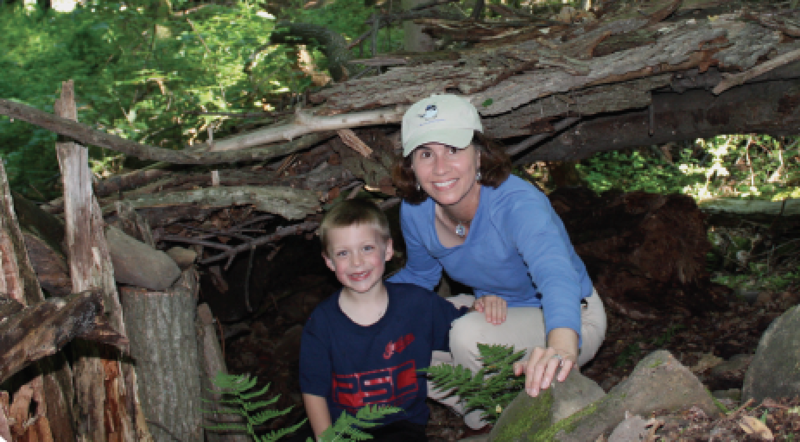 Priscilla Geigis and her nephew Grant pictured in front of their tree fort. Recreation and Park Association to promote parks as critical to addressing childhood obesity. Priscilla began her career in state government in 1992 as the Assistant General Counsel for the Department of Fisheries, Wildlife and Environmental Law Enforcement. She later served as the Director for the state’s nationally recognized Community Preservation Initiative at the Executive Office of Environmental Affairs. Priscilla holds a law degree from the Northeastern School of Law, a master’s degree in government administration from the Fels Center of Government from the University of Pennsylvania and a bachelor’s degree from Connecticut College. 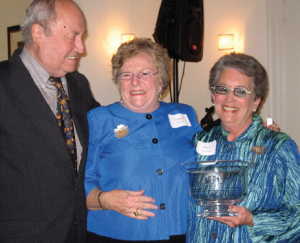 Hall’s Ponds’ own co-president Betsy Shure Gross was the recent recipient of the prestigious Boston Bowl from the Garden Club of America’s Boston Committee. This award recognizes civic achievement in the environment and horticulture by presenting awards for design, restoration of public areas or related achievements. Betsy and her dear friend, the late Corliss Knapp Engle, were co-recipients. The two neighbors were instrumental in saving Fairsted, now a National Historic Site preserving Frederick Law Olmsted’s Brookline home, office and archives. Corliss’ husband Ralph accepted in her honor. Among Olmsted’s many wonderful accomplishments in Boston and Brookline are “The Emerald Necklace” and Franklin Park. Guest speaker for the award event was Tupper Thomas, president of the Prospect Park Alliance, a public-private partnership with the City of New York. Chionanthus virginicus (Fringetree) can be seen in the formal garden. Spring is upon us and there is a lot happening in the garden and sanctuary. 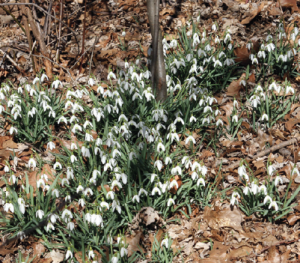 You may have seen the early bulbs poking their heads out as the birds were returning. New leaves were and still are popping out all over and early buds are beginning to open on the shrubs and trees. Things to look for…. Chionanthus virginicus (Fringetree) can be seen in the formal garden. This is a wonderful, small ornamental native tree. 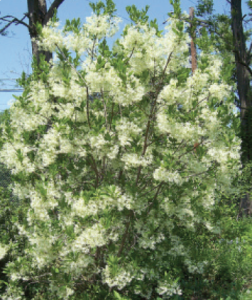 If you have seen it or happen to have one in your own yard, you may wonder what happened to it because it is one of the last trees or shrubs to leaf out in the spring. It is fabulous when it does because you also get the splendor of it’s’ profusion of fleecy white flowers. Its beauty in the spring is equal to its great yellow fall color. Look for it next time you are in the garden. On a smaller scale, but in eye-popping splendor, look at the yellow carpet forming in Amory Woods. 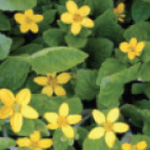 This native ground cover is Chrysogonum virginianum (goldenstar or green-and-gold). 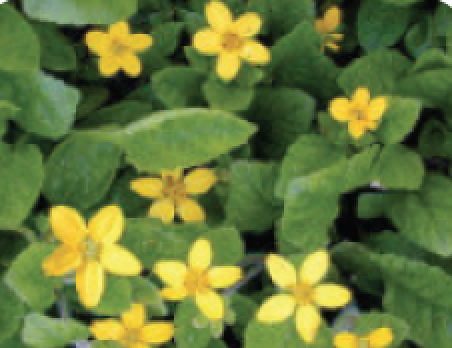 This is a good name for it as it is a carpet of green with profuse yellow blooms in spring and some throughout the summer. 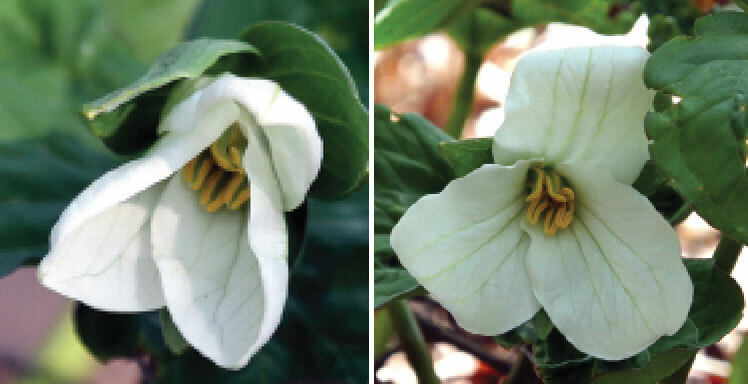 A great native plant for a shady place! 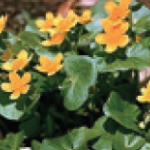 You can also see the profuse yellow blooms of Caltha palustris (kingcup or marsh marigold) brightening semi-shady area around the pond. A delight to behold! Hopefully everyone is aware of the effort the community, the town and our dedicated volunteers have put in to the ongoing maintenance of the sanctuary and garden. Your generous and continued support of the Friends of Hall’s Pond gives us the opportunity to fund work in this special oasis. Part of this public/private partnership we have allows us to work closely and manage the sanctuary. Your funding has allowed us to identify needs and purchase trees and shrubs for the garden and sanctuary. These purchases and installations can be for general garden needs, replacement of important trees, aesthetics or memorials. Most recently, notice the trees purchased and installed as memorials to Brookline citizens at the gates to the sanctuary. These two trees, Acer saccharum (Sugar Maple) and Ulmus americana (American Elm), were installed as a memorial to Marc Fried, and honoring Nancy and Ferris Hall. 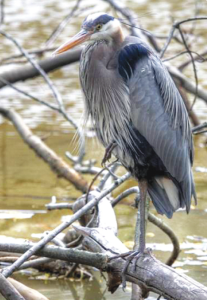 The new Hall’s Pond Sanctuary Work Plan, whose initial preparation was described in the Fall/Winter 2009 issue of this newsletter, is now complete. By this current issue’s publication in spring 2010, it is expected to have been formally accepted by the Conservation Commission and put to use for the spring community Work Day and other collaborative maintenance projects at the Sanctuary. The authors of the plan include Friends co-presidents Ellen Forrester and Betsy Shure Gross, Conservation Commissioners Gail Fenton and Randolph Meiklejohn (both also Friends board members), and Conservation Administrator Tom Brady. Tom, with Conservation Assistant Heather Charles Lis, ably coordinated the series of working meetings and supervised the graphic and technical production of the final plan document. The working group began with a clear goal: to create a practical guide for all seasonal maintenance and volunteer work at the Sanctuary, incorporating the perspectives of the Friends, the Commission and of Town staff. Soon enough, however, the editing challenges became apparent: how to write a plan detailed enough to describe the needs of the Sanctuary’s different natural areas, yet short and simple enough to be used in the field? At Tom’s suggestion the group decided to address each sanctuary area separately, with the idea that maintenance work customized to the characteristics of each area had the potential to best preserve the environmental diversity that is especially valuable at Hall’s Pond. The plan, therefore, consists of a sanctuary map divided into nearly twenty zones, and an accompanying chart indicating for each zone a shorthand name, a brief description, a long-term vision, and a few priority tasks. For example, the seasonally inundated areas in the Amory Woods section are called the “Amory Woods Wetlands,” described as “small, wet depressed areas with hydric soils, regular flooding,” and the vision is to “support wetland microhabitats.” Following from this current description and vision, specific tasks recommended include minimizing soil and plant disturbance, monitoring of invasive or escaped ornamental plants, planting with native plant species, and maintenance of the accessible paths and boardwalks. Note that for this area, as for several others, the first task noted is to minimize disturbance. While fences, paths and boardwalks must be safely maintained for visitors, the natural character and wildlife-habitat value of most of the sanctuary are often better preserved through restraint. As we enter the first season of the work plan’s use, we can all consider what its authors found during their fall and winter meetings: renewed common purpose among the Friends, the Commission and Town Staff about the needs of the Sanctuary, and readiness to re-think “maintenance” at a place where wild nature and city people come so close together. For the lawn, maintenance means mowing, but for that standing dead tree, rotting log or drift of fallen leaves, maintenance means letting it be. Every seasonal Work Day is an opportunity to remind ourselves what our work at the sanctuary is for and to teach a new person about it, through shared hands-on—and hands-off—experience. 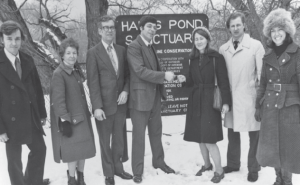 Hall’s Pond Sanctuary, celebrating Town purchase in January 1975. From left: Conservation Committee Director Hooper Brooks, Sara Wallace, Senator Jack Backman, Merrill Diamond, Environmental Secretary Evelyn Murphy, Representative John Businger, and Conservation Committee Chairman Mary Nelson. A map da ted 1746 shows Cedar Pond to be owned by Henry Sewell, a descendant of Samuel Sewall who was the judge who presided over the 1692 Salem Witch trials. David Sears II from 1818–1920 purchased 200 acres, including the Pond, and built homes for his six children (with such familiar names as Anna Powell Amory, Crownshield, Winthrop, Knyvet and Mason). Sears also built the Sears Chapel and developed the Longwood Mall. The Amory home, lying on what is now 20 Amory St. extended west to Powell St. and east to included what is now Amory Park and a portion of Hall’s Pond (at that time the pond extended farther into the Park). 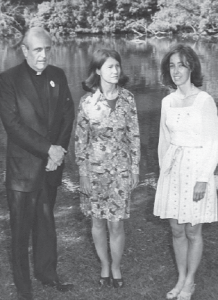 Congressman Father Drinan, State Environmental Secretary Evelyn Murphy, Chair of the Conservation Commission, Mary Nelson. In 1850 Amos Lawrence (son of the textile merchant for whom Lawrence, Massachusetts is named) purchased the pond and much of what is now the Cottage Farm neighborhood from Sears. Amos was an abolitionist and Lawrence, Kentucky, Lawrence University, and our own K-8 Lawrence school are named for him. He sold the lot that includes the Pond (then called Swallow Pond) to George Dexter in 1850 and Dexter, who was the architect for the Boston Athenaeum and superintendent of Trinity Church during its construction, built the home at 156 Ivy St. in 1851. The home was given to his daughter as a wedding gift and subsequently to his grand-daughter, Minna Hall, for whom the Hall’s Pond was named in the late 1800s. Minna was a bird lover and she and her neighbor and cousin Harriet Lawrence Hemenway, granddaughter of Amos Lawrence, undoubtedly spent time bird watching in their backyard pond. These two women formed a bird protection society which in 1897 had 900 members and lobbied the Massachusetts legislature for a law against “possessing or wearing the bodies or plumage of any Massachusetts song bird.” Of course, this political endeavor had a bit of help from their influential husbands and families. Their society became the Massachusetts Audubon Society, forerunner of other state Audubon chapters and the National Audubon Society. 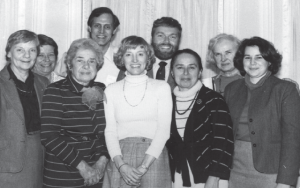 Directors of Friends of Hall’s Pond at Beacon St. apartment of Jo Albrecht, 1984. Front: Elizabeth Liddle, Jo Albecht (president), Nancy Hall, Joan Fried, Babara Whiting (Conservation Commission). Back: Helen Strider, Ferris Hall, Paul Willis (DPW Parks Conservation) Dorothy Arvidson. Meanwhile, Anna Powell Sears Amory died in 1895 and the Town purchased 8.2 acres from her Estate in 1903, including what is now Amory Playground. About this same time the owners of the Hall’s Pond parcel offered it to the Town of Brookline if the latter would maintain it has a park/sanctuary. The town declined the offer. Charles Newhall purchased the Pond and abutting land in 1910. Newhall had built the adjacent apartment houses on Beacon St. (as well as the 1200 Beacon Motel—now Holiday Inn) and he landscaped the formal gardens to the south of the pond. These were maintained by two full-time gardeners, with boating and picnicking for the exclusive use of his renters. When Newhall died there was an attempt to build a highrise on the site of the pond but this was prevented by the newly passed State Wetlands Protection Act of 1972 and this permitted the Town to purchase the devalued land in 1975, with help from State and Federal grants, for $65,000. The major players behind this purchase included Jackie Fried (Amory St. abutter and member of the Town Conservation Commission), Mary Nelson (Commission Chairman), Evelyn Murphy (MA Secretary of Environmental Affairs) and Father Drinan (our Congressman). 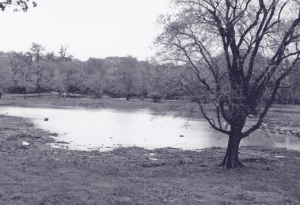 The purchase of the 3.5 acre Hall’s Pond in 1975 was followed by the purchase of the adjacent 1.6 acre Amory Woods in 1985 and these two sanctuaries were joined in 2001–2, at which time a $750,000 restoration was made possible by a generous donations of the Stoneman Foundation, as well as Town, State and Federal funds. These sites are part of the Cottage Farm Local Historic District as well as both the National and State Registers of Historic Places. 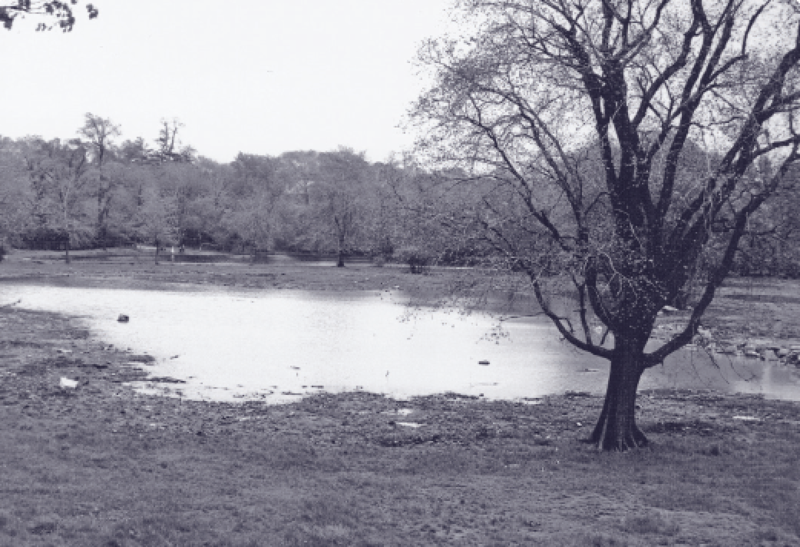 Hall’s Pond Sanctuary was Brookline’s first purchase for conservation purposes and continues to be administered by the Town Conservation Commission. The Friends of Hall’s Pond is a volunteer nonprofit organization founded one year after the Pond’s purchase in 1976. It was the first of the town’s Friends open-space organizations which now number over two dozen. Its founding president, Jo Albrecht (1976–1994), and her successor Barbara Mackey (1996–2005) carried the organization through many difficult times. These traditions have been carried on more recently by Janice Provencher, Ellen Forrester, and Betsy Shure Gross. 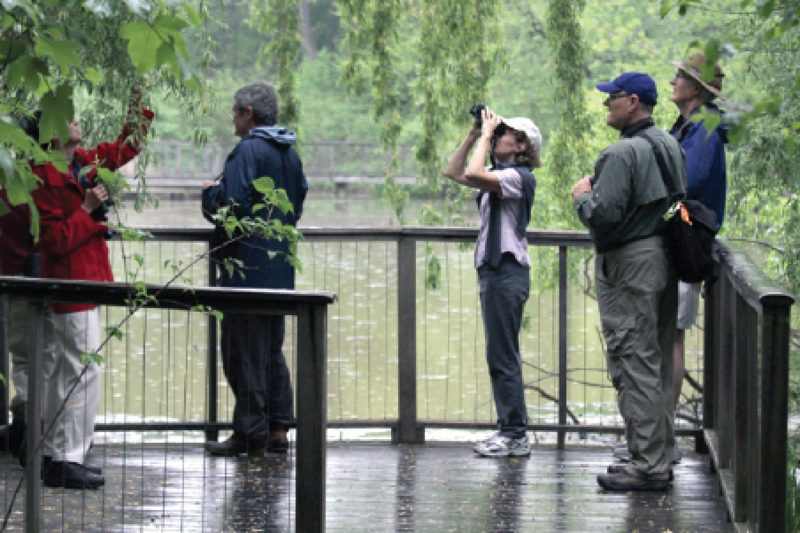 Fred (in blue cap) often leads birding walks right here at Hall’s Pond. You mig ht ask: How did Boston’s Wettest March— soaking us with a record fourteen inches—affect flora and fauna around Hall’s Pond and the Emerald Necklace? The long-run answer is, ‘probably not much.’ More Redwinged Blackbirds* and Common Grackles* perked the wetland marshes, migrants and nesters. April plant growth spurted vigorously, jump-started by a bunny-sunny Easter weekend. 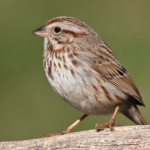 Reliable reports mentioned a Fox Sparrow preceding small waves of White-throated Sparrows (watch for a pearly-breasted, pink-beaked White-Crowned, and the buffy, streaky Lincoln’s), wag-tail Eastern Phoebe*, tiny, flitty Ruby-crowned and Golden-Crowned Kinglets. 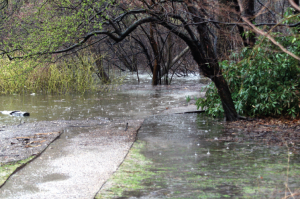 And no deluge could deter now-wintering hordes of American Robins*, a-cackle and sing-songy in bush and tree, wormpulling on every grassy expanse! By May, familiar flitting and twittering in the trees and bushes signal waves of warblers arriving overnight— most when following southwest winds. Seeking 25 warbler species at their favored altitude levels may aid identification. Tree-toppers include Blackburnian, Baybreasted, Blackpoll, Cerulean (rare). Black-throated Greens (that green is olive) and Blues (males in natty formal attire) and the Yellow Warbler* may be found feeding and singing vigorously on warmer early mornings, around or above eye-level. 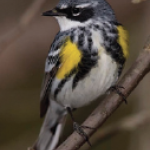 Closer to the ground ‘hang’ Palm and Magnolia Warblers, the branch-crawling Black-and-White, and members of the mainly yellow-and-black Oporornis family, such as Common Yellowthroat*, Wilson’s and Canada Warblers, and rarer beauties (Hooded and Mourning). Walking on the ground (often pond-side) is a usual habit of the Ovenbird, Northern Waterthrush, and true thrushes (Robin relatives): Swainson’s, and Hermit and Wood Thrush. 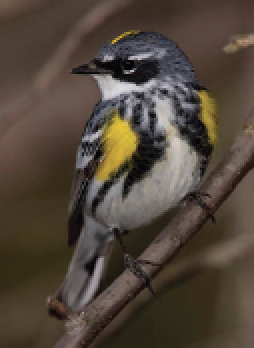 Easily the most numerous warbler is the Yellow-rumped Warbler, its white breast streaked with black and the tell-tale yellow (always the patch between its grey-black wings; often shoulder smudges, too). Though its plumage is quite variable, ‘Rumps’ are distinctive by being hyperactive— maybe sensitive to overcrowding! Other May showstoppers become summer friends: Gray Catbird*, Rose-breasted Grosbeak*, Baltimore Oriole, maybe the shyer Orchard Oriole*. Swallowtail … Happy Spring peeping! 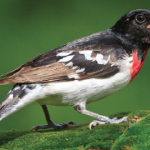 NOTE: * indicates nesting species likely to linger locally after June 1 to raise broods. Palm Sunday was somewhat chilly, but not unbearable. Walking down to Amory Park, one could see many dogs racing around the field. We quickly made our way over to Hall’s Pond, where, we gave a sigh of relief. The path was quiet as we made our way around, and one could see the beginnings of delicate snowdrops peak their timid head out of the ground: a sure sign of spring. Plump squirrels sprinted up trees upon hearing our heavy footsteps, and we wondered how they managed to scamper up with their prominent bellies. As we leaned over the rail of the bridge to watch the geese and ducks swim, we strained our eyes searching the water for any turtles that might have been braving the cold for a taste of sunlight. Later on, we spied a lady doing curious hand exercises. She donned a teal fleece and black spandex—a clear sign of an active person. Our curiosity made us approach her. After introducing ourselves, we slipped easily into conversation. She lived locally and visited Hall’s Pond about twice a week in the morning to get exercise. While she did not own a dog, she preferred to come in the morning to the woods where she would practice tai chi. When asked whether she was aware of the Board of Hall’s Pond, she nodded, saying that she sometimes attended the Work Days even though she did not consider herself a gardener. She might have been middle-aged, and two of us were awed by the fact that she still remained quite active. We thanked her and asked for her name and a picture, but she declined to give either one, saying she needed to get on her way. We were just finishing our walk, when we caught sight of a couple holding hands and entering Hall’s Pond. It occurred to us that Hall’s Pond attracts many types of people: high school students like ourselves, early morning walkers, couples, and many others. As individuals, we seek what Hall’s Pond has to offer, and each of us we comes away feeling satisfied. Hall’s Pond has flowers to gaze at, creatures to admire, and great people to meet. While every visit is different, our hunger for peacefulness is satisfied by this amazing place, where we are all recharged. I LOVE going over old journals of my Hall’s Pond prowls, especially just before spring again bursts forth. These much-edited snippets drawn from 1998 anticipate, then revel in, its vernal awakenings. I doubt that the primal drama will unfold much differently this year. Feb 18: White mantle covers the Pond, with a black rim of thaw. It is snowing gently, deliberately as I lock my bike. 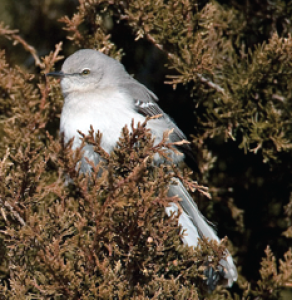 The sentinel Mockingbird, flushed from his post in the berries by the Beacon Street gate, eyes me from a low branch. Three jays, mulling over bread crusts in the elbow of the huge fallen elm, skedaddle into the birches. The dog-walker clique is subdued, and distant crow-caws are muffled in the white. I don’t go far on the path, scanning the cedars for nuthatches. The willow branches make a broad, beige haze in the falling snow. The cedar platform exudes a whiff of leaf mulch, but no birds. No wrens in the oak pile. I bike to Peet’s for a cup of bitter Yemeni. 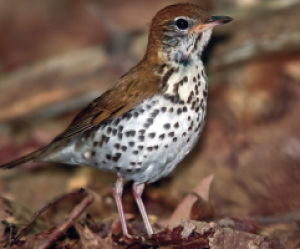 March 30: S. Carey and I go for L. Kaplan’s reported Fox Sparrow in the uplands — and find four under the pines and by the apple tree over the fence. And, in the pines, our two (first!) Phoebes, six Robins, and a startled Song Sparrow. No Sapsucker cruising Amory Woods. Is that a different Fox flock gathering by the water’s edge? As I hop the fence, I glimpse one more where my bike is parked next to cedar behind chainlink in private yard. Great Blue hunkers on the usual roost 15′ high over the water. E. Donneweerd says the first bird this winter died, and this is his replacement; her schoolkids have championed the pond and monitor its denizens. 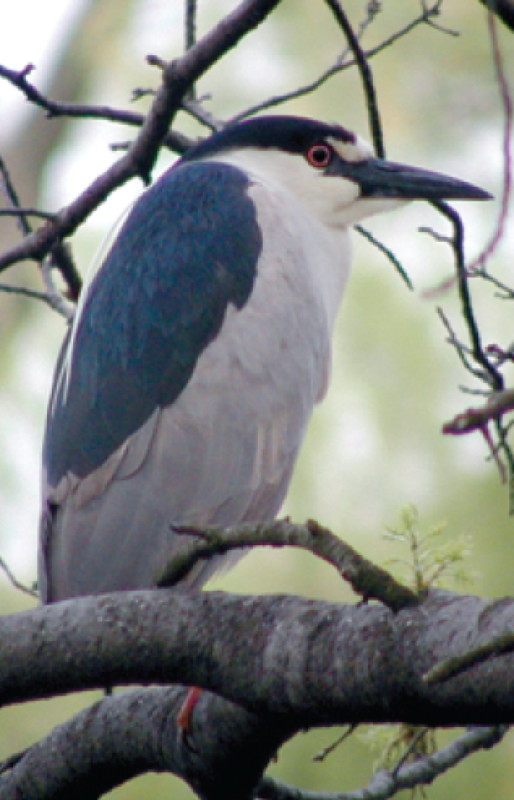 March 31: There’s a Blackcrowned Night-heron in the GBH’s spot, another year first. I get a proprietary glow watching her from the gangplank over the rusty-looking oily water. The Great Blue clambers down from overhead onto a roost ten feet away, but doesn’t stay long, with chatty people bustling through: with a ‘kwaak!’ he soars off toward the Charles, but the Night-heron remains calm, focused on fish. flitting across carpets of mulch and poison ivy sproutlets. 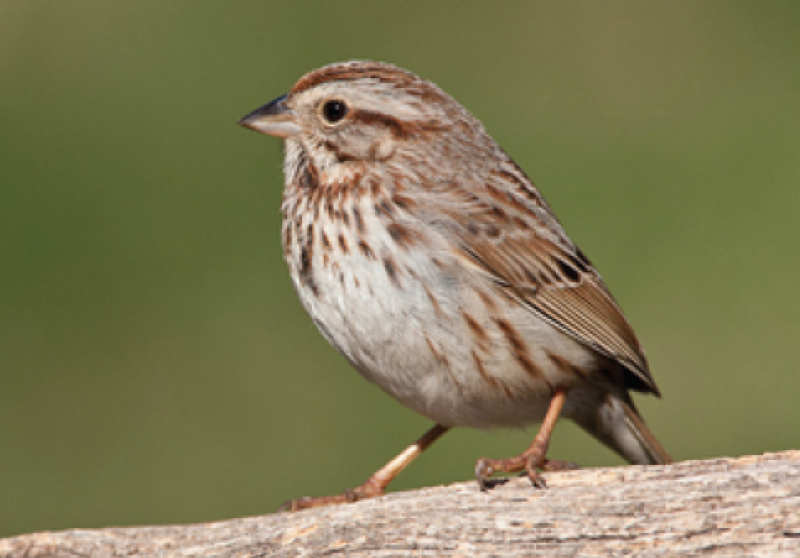 They mix in with House Sparrows, along the parking lot chain-link fence, and pick up a Song Sparrow for a minute. This kind of day there’s often more on the ground than in the air. At the end of the runway, two huge (1–2 lb., 12″) Carp make a ruckus: laying eggs in the shallow spot by buddling sheaths of lilies. They show folded dorsal fins and black crosshatched diamond pattern on a grey back. I rarely see them at all. Chipping sparrow pops up, and wren calls that sound more like House than Carolina. Overhanging fronds of multiflora rose should be lopped off on tomorrow’s cleanup. 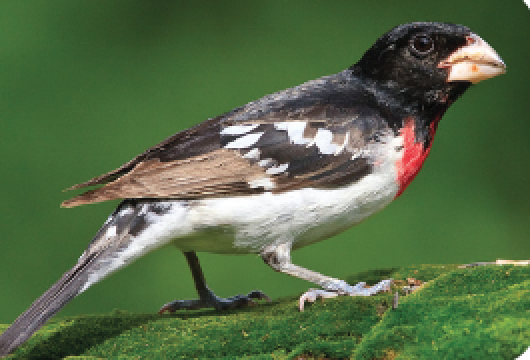 Robins rip through Amory, as the Whitethroats just amble along playing hopscotch. House Finches pipe up from the usual high ground spot, near Carolina wren nest. As I stand outside the ballfield willows scanning across the pond for the Waterthrush, huge splashes signal more grey-weather activity by the resident Carp. Amory’s quiet, except for a Catbird (first!) heard by bike-parking spot. Chunk of wood and a squirrel fall 20 feet in front of me by the gazebo bench! Mallard pair in Amory pool, resting. Not one thrush. Pair of Sapsuckers moves slowly, deliberately, from large elm to the next, eastward. One’s an adult; the other? not sure. Most years Fred (center) joins fellow birders for a hawk watch at Lighthouse Point, Conn., followed by a gathering at the world famous Frank Pepe Pizzeria in New Haven. 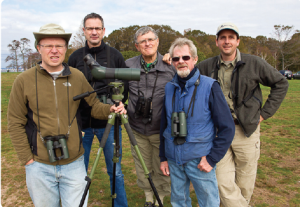 The Friends of Hall’s Pond Board of Directors doffs its hat, and dedicates this edition of the Newsletter to our longtime board member, Fred Bouchard bird watcher extraordinaire. For his gift of time over time: abundant thanks. 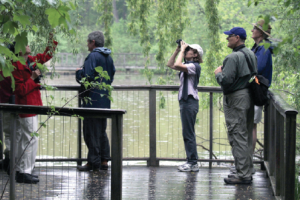 Fred has been leading bird watching expeditions at Hall’s Pond, sharing his talent and sharp eye, and educating people about the value of Hall’s Pond as a sanctuary for resident and migrating species. 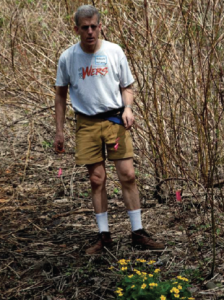 His teaching skills have engendered lifelong pleasure for his groups of bird watchers and fostered our commitment to environmental protection and sanctuary management for our avian friends. We acknowledge Fred’s skills and his generosity and are always grateful for his participation in our stewardship endeavors.. Thanks Fred! You walk in Minna and Harriet’s footsteps…. WHY, you might ask, do those two things go together? Community is the answer. Brookline Booksmith has spent 51 years here, building a life in this town. That life covers not just our retail business but the business of connection, as well. Hall’s Pond is a gem of nature a few blocks from our store. It’s a place of respite, of inspiration and of education. That might well describe our store’s very essence. So, far from being an odd pairing, board membership is a great fit for me. I’ve “only” been at the Booksmith for 31 years and a resident for 26. Part of my role at the store is to be the somewhat public face of it. That has afforded me the chance to sit on a number of boards, business and nonprofit. I’ve met numerous wonderful townsfolk in this fashion. And had the opportunity to turn them into customers if they were not already. In turn, I’ve learned many layers of what makes this community so very special—committed, passionate, very smart, very funny and very diverse people. Again, I see parallels with the people who work in our store and the very nature of being booksellers. As it happens, I’m also fond of gardening though not very expert at it. Being involved with the Hall’s Board has allowed me to learn from very knowledgeable plant, tree and bird individuals. The sanctuary is truly a marvel. In these days of distress about and for our planet, knowing the value of our natural world has never been more important. The word gentle comes to mind when I think of Hall’s Pond and its stewards over many decades. Our world could use a lot more gentle. I hope readers will get right out of their chairs and head down Beacon St. to Amory St. It’s beautiful in the Sanctuary and Amory Woods at all times of year. Then, whether a business person interested in doing well by doing good or a private individual wishing to make a meaningful contribution, contribute to and participate in the upkeep and survival of this treasure. The Friends of Hall's Pond is dedicated to the preservation and protection of Hall's Pond Sanctuary in Brookline, Massachusetts. Through the encouragement and coordination of volunteers in education, conservation and maintenance, the Friends seek to ensure a healthy future for this valuable urban resource. DONATE: Help Friends of Hall’s Pond maintain and improve the Sanctuary, we are now accepting online donations! For further information about membership, volunteering, or to contact the Friends, please email: friendsofhallspond@gmail.com. Our organization is interested in your communication and encourages your involvement. The Friends of Hall’s Pond is a 501(c)3 organization.